Yerevan, June 18, 2015 — The Hayastan All-Armenian Fund has begun constructing three more community centers in Artsakh, in the villages of Kyuratagh (Hadrut Region), Getavan (Martakert Region), and Sargsashen (Martuni Region). All three projects are sponsored by the French-Armenian community, with additional financial support from the government of Artsakh. Most of the residents of the three villages, whose total population is a little under 1,030, are farmers. The community centers being built in these villages follow the Hayastan All-Armenian Fund’s highly successful model of efficient, multifunctional structures that streamline the civic and cultural lives of rural communities. Each of the community centers will comprise a mayor’s office, a health clinic, a library, and an events hall. Commenting on the launch of the community-center projects, the mayors of the three villages conveyed their deep gratitude to their French-Armenian compatriots, stating that the initiatives have been met with the great enthusiasm of their respective communities. 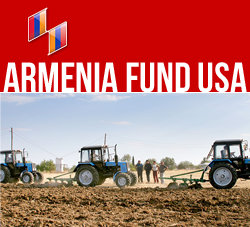 “Implementing projects which improve the quality of life of rural communities, in Armenia and Artsakh alike, is among the top priorities of the Hayastan All-Armenian Fund,” says Executive Director Ara Vardanyan.